Y-Strainers are typically used in applications where the amount of solids to be removed is small, and where frequent clean-out is not required. Besides their obvious uses in liquid applications, they are most often installed in gaseous services such as steam, air, nitrogen, natural gas etc. Y-type strainers in a wide variety of sizes and materials to fit most pipeline straining requirements. The compact, cylindrical shape of the Y-Strainer is very strong and can readily accommodate the high pressures that are common in this type of service. A steam pressure of 1500 psi will often be found at temperatures of 500°C. The strength of the standard Y-Strainer design can easily accommodate these extreme parameters although the material of construction will probably be alloy steel. A Y-Strainer has the advantage of being able to be installed in either a horizontal or vertical position. However, in both cases, the screening element must be on the 'downside' of the strainer body so the entrapped solids can be properly collected and held for disposal. Y-Strainers are offered to meet the specific requirements of the intended service. Carbon Steel construction is offered when strength to meet pressure/temperature parameters or resistance to mechanical shock is required. 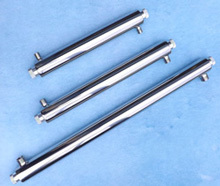 Stainless steel is a common material for corrosion resistance considerations. 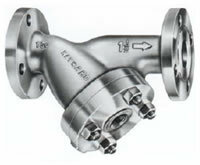 We can also offer a full range of Model 80 Y-Strainers covering flanged end connections to 1500lb rating and socket weld/threaded connections to 2500lb rating.